What exactly is junk food? Sadly, it is what many Americans snack on. Full of artificial ingredients, high in calorie, empty in nutritional value, junk food is like junk toys: they do not sustain you and yet can cause great harm to your health and the planet. 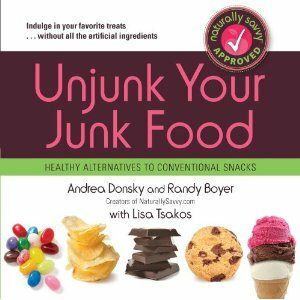 Unjunk Your Junk Food: Healthy Alternatives to Conventional Snacks by Naturally Savvy founders Andrea Donsky and Randy Boyer explores how you can still indulge in snacks without being exposed to the “The Scary Seven” worst ingredients found in junk food. ARTIFICIAL SWEETENERS: Chemical sweeteners including Aspartame, Splenda (sucralose), Ace-K (Acesulfame Potassium), Saccharine, etc. PRESERVATIVES: Polysorbate 60, 65 & 80, TBHQ, Sodium Benzoate, BHA, BHT, Sulfur Dioxide (sulfites). This book is a visual display of product images of popular junk food items and their more natural alternatives. Explanations of ingredients with simple thumbs up or thumbs down graphics makes it easy for readers to learn about harmful products and their healthier alternatives. The wonderful thing about the growth of the health food marker is there now are healthier, organic alternatives to almost every kind of conventional junk food item found in a supermarket. As part of this review, I was asked to examine my own cupboard for these items or ingredients. I am happy to report that we don’t have any of them! We made the switch to healthier junk food a long time ago. If it wasn’t organic, we didn’t consumer it. Some of these seven scary ingredients are found in other products in our home. Sodium benzoate is present in our shampoo, and sulfites are in some of our wine, but neither of these are “junk” foods. My wine is not junk! Junk food is still junk food though, organic or not. It may be better for you because of the absence of chemicals, but it is still not as healthy as just eating fresh fruits and vegetables for your snacking. It’s good to get our kids started early thinking of these as appropriate snacks rather than potato chips, candy, and popsicles (organic or not). I do like the simplicity of the layout of this book, and I think it will be a great book to share with the relatives who still snack on junk food containing these dangerous ingredients. We do have organic junk food in our house. Don’t want you to think I am a hypocrite! As parents, we were raised on these flavors we still sometimes crave. Disclosure: I was sent free samples of these products to review. No prior assurances were given as to whether the review would be positive or negative. ‘Like’ Naturally Savvy on Facebook and ‘fan’ them on Twitter for your chance to win great prizes from their sponsors.